Get The Right Part Right Now. At Nextran, we carry parts for all makes and models including Mack, Volvo, Isuzu, Ford, Kenworth, Peterbilt, Freightliner, and International. We are proud to provide the right parts, at the right price, right now! Our network of truck dealerships across the southeast provides you with consistent availability at aggressive pricing. We partner with all of the major OEM parts manufacturers to ensure that the parts we sell come with the same quality that you can depend on with warranties that you can trust. No one beats our team of experienced parts experts along with an award-winning team of factory trained technicians. It’s all a part of our plan to keep you moving. 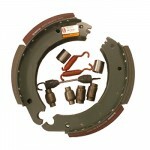 Featuring premium long life friction material, the Meritor Q-Plus brake shoe provides trucks and trailers with premium stopping performance, and is designed to minimize maintenance and downtime. 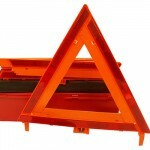 The fluorescent orange Triangle Flare Kit comes with three triangle reflectors that provide adequate visibility, day or night. We offer ongoing parts promotions throughout the year that save you time and money. Take advantage of these huge savings! Sign up to be a “Truck Insider” today and stay up to date with all of the upcoming promotions.